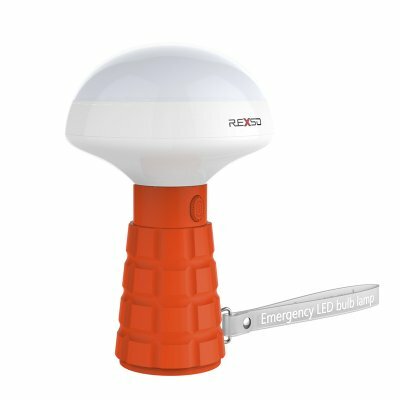 Successfully Added Rexso R1 Emergency Flashlight - 600 Lumen, 38 LEDs, Emergency Light Mode, 1800mAh, Magnetic Rear, Comfortable Design (Orange) to your Shopping Cart. Never be left in the dark again with this 600 lumens multifunctional emergency LED light. Packing 38pcs of ultra bright LEDs this emergency light casts a magnificent beam of light in whatever direction you point it – lighting up your surrounding in a cool white light. Whether you use it during camping, keep it in your car in case of an emergency, or leave it at home to be used in the unlikely event of a power-off – this multifunctional LED light is guaranteed to meet your needs. Featuring an 1800mAh rechargeable built-in battery this LED bulb lamp provides you with 10 hours of usage time, taking away the fear of ever being left in the dark. Its two light modes allow you to use this nicely designed emergency LED as a regular flashlight and, additionally, features an emergency mode in which bright beams of red flashing light will be cast from your torch that is guaranteed to grab the attention of anybody in the area. A powerful magnet at the end of the torch allows you to sufficiently attach it to any steel surface. With its mushroom design that fits perfectly in your hand, this LED torch is comfortable to hold. Coming with a little wrist brand attached to it you can be assured that even in the most stressful emergency situations you won’t have to be afraid of dropping your torch. Perfect to be used during any outdoor activities such as hiking, nighttime fishing, and camping, this LED emergency light additionally forms a great and essential asset to any household or car safety kit. The Rexso R1 emergency flashlight comes with a 12 months warranty, brought to you by the leader in electronic devices as well as wholesale electronic gadgets..